Where is it? Watarrka National Park, 300km north-east of Uluru-Kata Tjuta National Park, NT. 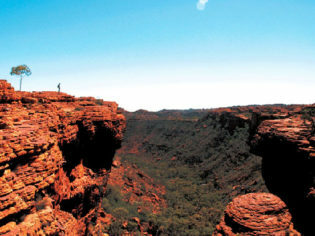 Most people visit the Red Centre to see the Rock. 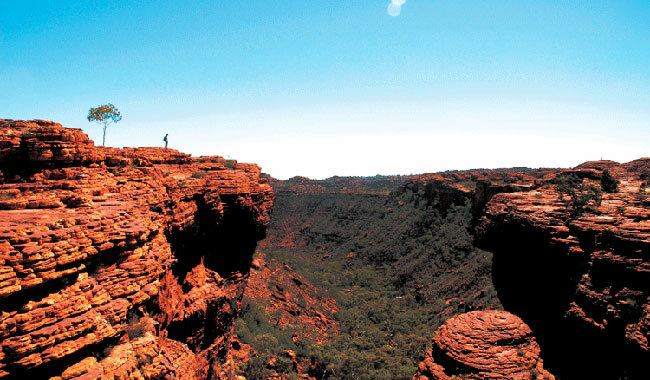 While Uluru is undeniably an experience not to be missed, a surprise highlight for many is Kings Canyon. It’s astounding that this phenomenal land formation so often flies under the tourist radar, but in a way it’s a good thing. If you’re in the area for Uluru alone, you’ll be overjoyed to find this rugged, prehistoric-looking canyon, with walls rising up to 270m above the canyon floor. A sheer climb up the rock face allows access to a 6km rim walk, with vertiginous views across rugged landscape to the George Gill Ranges. At the top of the canyon you’ll find weathered, buttressed domes and prehistoric-looking trees in The Lost City, and a valley with pooled waterholes and lush vegetation in the Garden of Eden. A truly awe-inspiring hike at the heart of Australia.